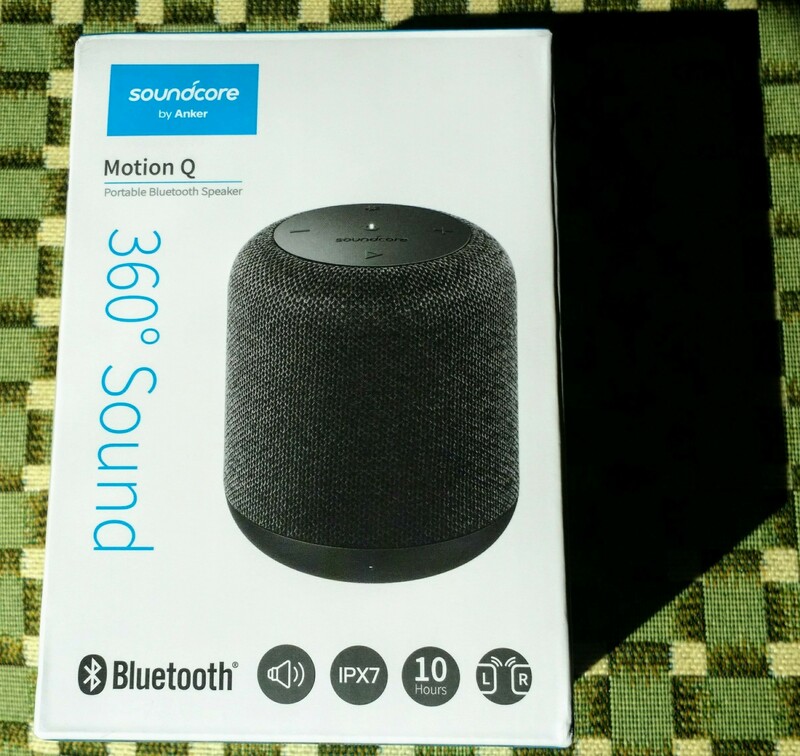 ​The SoundCore Motion Q has a variety of appealing features, including the play/pause buttons, the volume controls, the bluetooth connect/disconnect button, the 360˚ sound, being IPX 7 waterproof, the low cost, and having speaker pairing. At this point, volume controls and a play/pause button are standard among all SoundCore devices(Headphones as well as speakers), but a few things set this speaker apart from others. To start, the pairing button is incredibly useful not only because it allows you to connect and disconnect your SoundCore Motion Q without touching your phone, but it allows for you to connect and disconnect with other copies of the SoundCore Motion Q. By pairing with another SoundCore Motion Q, you can have the two speakers simultaneously play the same sound, or you can have them function as a left and a right speaker. While this may not necessarily be important to all customers, this feature allows you to listen to music the way the artist intended. This feature has appeared in all of SoundCore's most recent speakers, but is still a rare feature that allows for the same speaker to get better as you put more money into it. This speaker is currently listed at $46 on Amazon, so having this feature allows for this speaker to not only manage as a solid budget option, but become similar to a full sound system when you buy two(notably still under $100 to buy two). Next, 360˚ sound has been seen in a several JBL speakers, and in the SoundCore Flare as well. JBL speakers are in general higher quality than the Motion Q, but cost far more. The cheapest JBL speaker I could find on the official JBL website was the Link 10, and weighing in at $150(ignoring the current sale), over 3 times the cost of the Motion Q. The SoundCore Flare, on the other hand, is essentially a $15 upgrade on the Motion Q. It is equally waterproof, can pair with other SoundCore Flares, has all of the same buttons, has a slightly longer battery life, and lights up according to the mood of the audio being played. So while this 360˚ sound feature isn't necessarily unique, the Motion Q is the cheapest speaker available to have such a feature. Another of the features I mentioned was being the MotionQ's being IPX7 waterproof. So what exactly does that mean anyways? IPX7 waterproof devices can survive being under up to one meter of water for up to 30 minutes. So, after throwing my speaker in the local pool, I found that this speaker not only can survive the water, but it floats. Since it floats, how far underwater the speaker can survive shouldn't actually be a concern, as the speaker won't ever sink below the one meter threshold. Since it floats and plays sound on all sides, you can actually throw your speaker in the pool connected to your phone, then play sound, as a side playing audio will always be above water. As a swimmer, I love the fact that the Motion Q is waterproof, and actaully think I will begin to look for this in my future speakers. Lastly, and most importantly, how is the sound quality? After all, a waterproof speaker that can pair and play audio on all sides is absolutely useless without good sound quality. The sound quality is amazing, and comparable to speakers completely out of this price range. I also was slightly concerned about the bass, since it was a tad underwhelming in a couple of previous Anker models. Fortunately, it appears that this feedback was received, as this small, portable speaker packs a punch and has an all-around excellent sound quality. So, overall, I would recommend this speaker to anyone looking for a portable speaker within the price range of $20-$50, or two of the speaker for anyone looking at speakers around $100, since the Bluetooth pairing just makes the Motion Q that much better. Also I forget to mention earlier the battery life is exceptional, I've only needed to charge it once this last week with moderate use. The 10hr battery life is an understatement and easily reached. This review and pictures was written and taken by my little brother who quickly snagged the motion q when it arrived. I am proud and hope he will catch the review bug like I have. I love my Motion Q as well. It's just right for me since the Flare's LED light show do nothing for me since when I'm listening to music, I'm not looking for a light show. To top it off, you get a few more watts of power with the Motion Q. Good job with your review! Nice review and pics! Give your little brother my congrats!